Bask under the gentle heating pressure of the InfraMat FullMat-015JT-Ph. The full mat can comfortably fit on any area of the body, promoting general wellness and overall health. This mat contains pounds of healing stones to further increase the general wellness experienced by the user. The stones in this mat are jade and tourmaline. Each stone has healing properties for both the mind and the body. By combining the unique healing properties of jade and tourmaline with the heat from the InfraMat Pro, the body experiences relaxing health improvement and a radically extraordinary detoxification. Utilized alone, the properties of the jade stones would promote health and wellness. Combined with the properties of tourmaline notably increases the effectiveness of the InfraMat Pro. This full mat is 150 x 60 cm, weighing only 6 kg. Each jade and tourmaline stone is 1 inch in diameter. This full mat contains 99 jade stones and 108 tourmaline stones. 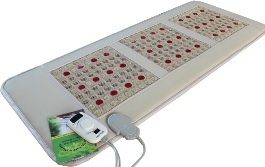 The mat also contains 36 photon bulbs to improve health. Unique to the InfraMat FullMat-015JT-Ph is the high-level output of negative ions. The high output of these negative ions manufactures positive biochemical cellular reactions throughout the body. For example, some of the positive biochemical reactions include a boost in cellular metabolism and can be used to aid in weight loss. In just one hour of use, the InfraMat Pro can burn up to 900 calories. Additional biochemical reactions include counteracting free radicals in the body, strengthening immune system function, and boosting mood and relieving stress by increasing levels of serotonin and melatonin in the brain. This amazing mat has the technology to improve overall function of the body and the mind. The peaceful and soothing heat penetrates deep into the muscles and tissue to provide comfort, increase circulation, and flush toxins from the body. The contemporary adjustable heat control is featured on an LED display. The InfraMat FullMat-015JT-Ph is lightweight and surprisingly compact. Not only does this mat store easily, due to the compact and lightweight features, but the mat is also ideal for traveling. Fitting easily into luggage, the mat allows you to take its healing benefits with you wherever you go. The InfraMat FullMat-015JT-Ph is ideal for all body shapes and sizes. This mat can be moved easily to cover different areas of the body. The flexibility of the mat makes using it on different areas for various healing benefits simple and easy. Don’t allow pain and discomfort, mental and physical, to rule your life. Order this luxurious mat today! This mat was developed with your comfort in mind. Guarantee positive healing benefits for yourself or friends and family.